When asked questions about climate change, many Republicans are in a tough spot. If they say they know the scientific consensus is that human-caused climate change is real, they run the risk of alienating members of their base who don’t believe that. But seeing as most Americans actually do recognise that climate change is occurring and is an issue, not all Republicans are willing to claim, like Oklahoma Sen. James Inhoffe, that facts generally accepted as true are a hoax. So many default to what they must think of as a middle ground. They point out that they aren’t scientists. Do they have opinions on how to best maintain our nation’s highways, bridges, and tunnels — or do they not because they’re not civil engineers? Do they refuse to talk about agriculture policy on the grounds that they’re not farmers? How do they think we should be addressing the threat of ISIS? They wouldn’t know, of course; they’re not military generals. No one would ever say these things, because they’re ridiculous. Yet, when it comes to climate change, the “I’m not a scientist” line somehow persists. Stephen Colbert provided a whole montage of prominent Republicans making the claim during the Nov. 6 episode of the Colbert Report. 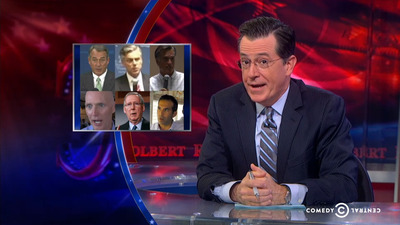 Colbert also includes news clips of John Boehner, Mitt Romney, Mitch McConnell, and others uttering the same line. And with the actual global warming denier James Inhofe very likely taking over the Senate Committee on Environment and Public Works, Colbert has one more message for the young members of the audience. Watch the full video below for a great demonstration of Florida sinking under rising water levels for a completely inexplicable reason.